It is time again for the annual exhibition for the art class I attend. It is also that time for the last minute rush/panic that always seems to accompany such events! 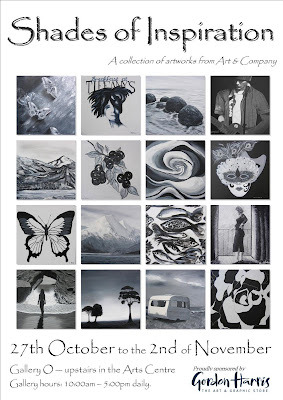 This year there has been the inclusion of a black and white themed wall, with artists able to paint anything of their choosing onto a 40cm x 40cm canvas. I wanted to do one but unfortunately I didn't have time. This year I am fortunate enough to be able to include my candles in the exhibition, in addition to the two paintings I have done. So I've been replenishing my stocks and planning how it's all going to look. So if you're in Christchurch between the 27th of October and the 2nd November, pop down to Gallery O in the Arts Centre to see a wide range of paintings, from beginners through to experienced artists. If you haven't seen my candles, or would like to see them again, this is a great chance to have a look at them, and smell the different fragrances.